As they strode—as this man could do nothing except stride with confidence—through the room, he acknowledged a few but was greeted with deference. She’d been correct about his title. She wondered how many lesser ones he might possess, how much property. What was he worth? Based upon the excellent tailoring of his black swallowtail coat, trousers, and waistcoat, along with the jeweled pin nestled in his cravat, he was worth a princely sum. They arrived in a room that was much darker than any of the others she’d viewed. The walls were papered in rich burgundy and forest green. The furniture matched. A massive fireplace dominated one of several sitting areas. Glass cabinets held an assortment of spirits. Liveried footmen served amber liquid. She finished off her champagne and set the flute on the tray of a passing footman. The man beside her—Avendale—did the same. She didn’t like noticing that he seemed to belong here more than in any other place. That he was made of—and for—debauchery. He was comfortable with his surroundings, would flourish here as well as in the bedchamber. She was rather certain of it. Even in shadows, he would stand out, prowling toward her, conquering every aspect of the night, conquering her. She wouldn’t so much as whimper in protest. “Would you care for something darker?” he asked. He grinned wolfishly, and for a moment she feared he read all her thoughts. A shiver went through her before she grasped his meaning. He’d distracted her. Normally she kept her head around men, even handsome ones. Or perhaps she was giving him too much credit, had simply sipped the champagne far too quickly so that her mind had dulled for a moment. “Is it allowed?” she asked innocently. He held her gaze and she was no longer certain they were discussing liquor. Things not allowed generally were more enjoyable. How did he know that was what she preferred? What she thrived on? The forbidden was always more alluring. She suspected many of the ladies would soon wonder what all the fuss had been about now that they could walk through the doors whenever they chose. “Did I hear my name taken in vain?” a deep voice asked. Turning to the side, she came face to face with the man she’d earlier seen kissing the woman in the dance area. That woman was now beaming with happiness and inappropriately nestled against his side. But then Rose supposed in a place like this nothing was entirely inappropriate. That was the entire point to it. “I’ve been taking your name in vain ever since you came up with this ghastly idea to allow women into our sanctum,” Avendale said, clearly disgruntled. So he had only a temporary interest in her. Perhaps for just tonight. A tryst, something wicked. She was insulted enough to take offense, but not so much that she wasn’t also flattered. But both emotions were schooled not to show. Much more satisfying to make him pay later for his arrogance. Oh, and how he would pay. She could hardly wait, but taking her time would make it all so much sweeter. Links to Lorraine’s website, blog, books, etc. Your book sounds really interesting. I’ve added it to my TBR . 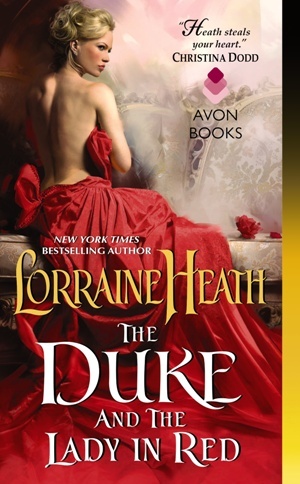 Thank you for hosting THE DUKE AND THE LADY IN RED!